I recently bought this wicked Polaprinter - you can use 35mm slides and project them on polaroid/fuji packfilms. I had some packfilm, 669 (very expired) and fp 100c, so I decided to have a go. My first attempt was to print my digital pics on transparencies using my epson printer - it was complete crap. Though the inkjet negative looked good - the enlargements don't lie. they were crap. I'll do a bit of a write up about this later. So I basically went through a pack of 669 trying to get something to print. 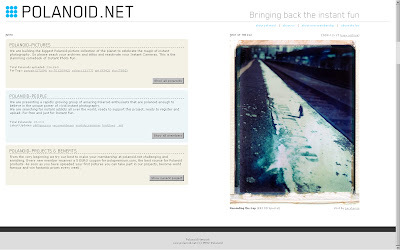 Finally, and wisely, i decided to use it on some real b & w slides and the results where much, much better. I have no idea what kind of film I used below, but the negative was red, but I do know it was for colour film. 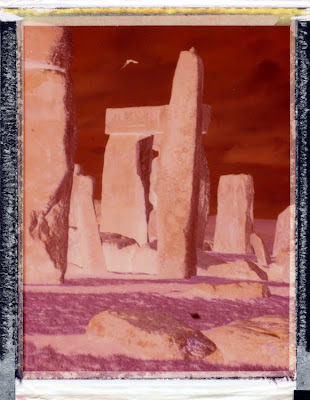 The shot was taken at stonehenge during late December of 1999. Edit 14/01/2010: This is colour negative film, not colour slide film. Apparently colour negative film has orange/red mask to it. The polaprint is designed for colour slide film.